“Coach Kiwi” is the hottest, up–and–coming Fitness Trainer in the state of Michigan. With more than 10 years of experience in the fitness industry, Coach Kiwi has dedicated her career to helping her clients not only transform their bodies but also their minds, when it comes to living a healthy and active lifestyle. By pushing each client past self-doubt and demanding only their personal best, she helps people overcome mental blocks that stop them from achieving their goals. Coach Kiwi is definitely not your “run-of-the-mill” trainer. Her passion for people, her commitment to integrity and keen focus for each individual, is the recipe for her client’s personal success. Coach Kiwi’s mantra is, “I take your results personal,” and she has the track record and dedicated following to prove it. Coach Kiwi earned a bachelor’s degree in Engineering and Graphic Technology from Western Michigan University. She is also a former starting running back for the five-time National Champions, “Detroit Demolition,” Women’s Professional Football Team. Coach Kiwi’s experience and capacity runs deep as she does more than just individual training, she instructs cardio kickboxing, cycling and group training. She is also a strength and conditioning trainer and offers sports specific training as well. A few examples of her clients include professional football and basketball players, track & field athletes, gymnasts, etc. As the CEO of BSTXTRM Fitness and BSTXTRM Fitness Training, Prepped Nutrition and Blood Sweat and Tears Clothing ™, Coach Kiwi is sought after for her expertise and guaranteed results. In September 2014, Coach Kiwi embarked on what was yet her most challenging endeavor. 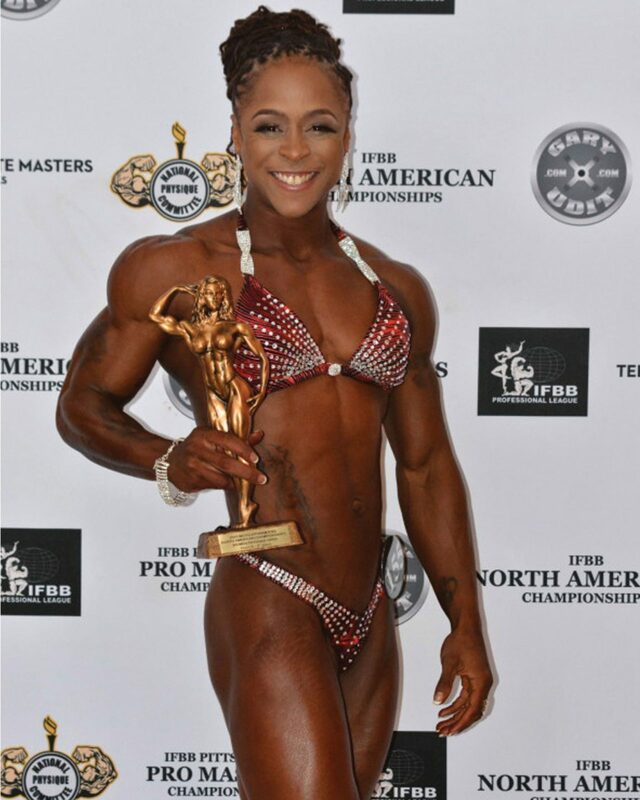 She competed in her first fitness competition where she placed 1st in Women’s Physique Short Class. Later in that year, she earned the Iron Man Women’s Physique Championship. In 2015, she returned to the stage aggressively focusing on looking better than she ever had in her life. With this endeavor, she found an International Federation of Bodybuilding and Fitness (IFBB) Hall of Fame coach, revamped her diet and pushed her body to its limits. At the National Physique Committee (NPC) Western Michigan Championships, she won 1st place in Women’s Physique Open Class. This victory qualified her for a national level competition. Coach Kiwi was determined to bring her very best body to the stage. She hired nationally renowned Nutrition Coach, Shelby Starnes, and Professional Posing Coach, Kenny Wallach, to make sure she not only looked her best but was able to show best in the competition. After an arduous 30 week training season, she took the stage at the North American Championship in Pittsburgh, PA in September of 2016. After putting her Blood, Sweat and Tears ™ into her training, she showed up looking her career best as she went up against some solid competition. Coach Kiwi won 3rd place in her first national show! With another accomplishment under her belt, she continues to improve her physique, broaden her expertise in fitness and bodybuilding while helping her clientele achieve their goals as well. Coach Kiwi’s main objective and hope is to ignite a passion for living a healthier lifestyle in everyone and wherever she goes.